Who the Hell Is That Cool Lead Actor on HBO's 'The Night Of'? This article contains light spoilers from the premiere of HBO's The Night Of. 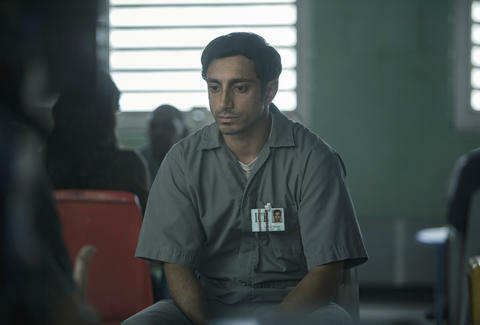 When you first see actor Riz Ahmed in The Night Of, his character Naz sits among a cluster of college-aged faces, scribbling down notes in an advanced calculus class. Roughly 30 minutes later, the 23-year-old Pakistani-American student is again sitting and thinking, but alone, locked in the back of an NYPD cruiser, the witness of a murder to which he knows he'll be the only suspect. Ahmed will look familiar if you caught him in the creepy movie Nightcrawler, as the assistant cameraman to Jake Gyllenhaal's Lou Bloom. The 33-year-old Englishman has also appeared in The Road to Guantánamo, Closed Circuit, Ill Manors, Sally Potter's Rage, Britz, and The Reluctant Fundamentalist. As a lead, he has transformed into the bungling terrorist cell leader in Chris Morris' Four Lions, the convincingly torn drug dealer that gives Shifty its name, and the controlling rake seen opposite Freida Pinto in Trishna. Originally from Wembley, northwest London, Ahmed studied philosophy, politics, and economics at Oxford before switching to acting at the Central School of Speech and Drama. (He first experimented with theater in high school, after one of his teacher's reportedly told him that "if you can muck about on stage, you get a clap for it, not a suspension.") He was 23 when he debuted in Michael Winterbottom and Mat Whitecross's British Guantánamo docudrama, about the Tipton Three. Six years later he was feted as one of the Berlin Film Fest's Shooting Stars. He recently spent time as a writer-director for "Daytimer," a coming-of-age short that won a grand jury prize at the Nashville Film Fest in 2015. And his stage work includes appearances in such plays as Stephen Adly Guirgis's Jesus Hopped the A Train and Shan Khan's Prayer Room -- the latter of which entailed a "genuinely disconcerting" portrayal, per the Telegraph, of a "street-talking, dope-smoking young Muslim who turns into a murderous firebrand." Contrary to what Ahmed's filmography might indicate, he appeared in Nightcrawler after shooting an early version of The Night Of's pilot. (The HBO project got a greenlight way back in 2013 under a couple different titles and with James Gandolfini originally in Turturro's role. Consequently, scripts were retooled, but the overall idea is still loosely based on Peter Moffat's 2008 BBC series, Criminal Justice.) Series co-creator Steven Zaillian said in a promo interview that he cast Ahmed after watching him in Four Lions YouTube clips. Ahmed takes his work seriously. To research his role in The Night Of, the actor reportedly interviewed real prisoners at Rikers and attended classes at schools in the Bronx and Queens, all while honing a sharp American accent. "I found a real connection to Riz as a person," actor John Turturro, who plays Naz's world-weary lawyer, told EW in a recent interview. "He's really talented and a real hard worker and so smart. Look at his performance -- it's not overdone, not at all. That's where the whole thing lives. It's all in the minutia and the moment-to-moment life and the cost to this young man's life. And that's all Riz." This year is proving a big one for Ahmed. On the acting front, he'll next be seen in the Star Wars standalone movie Rogue One, this summer's Jason Bourne, and the sure-to-be-prestigious drama Una, starring Ben Mendelsohn and Rooney Mara. He's staying humble. "People always say, 'When this thing comes out, everything will change for you,'" he told EW last month. "People have been saying that to me my whole life. I just don't believe a word of it."